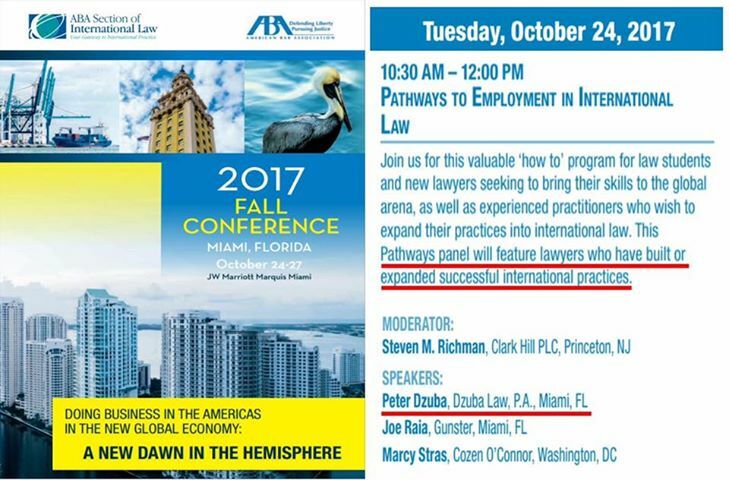 Dzuba Law is honored to have Peter Dzuba as one of the four panelists of the opening panel of the Prestigious ABA International Law Section Conference in Miami, Florida which will take place on October 24th-26th. Peter will be on the panel with the President of the Section Steven M. Richman, together with several other of the most outstanding international lawyers in the country. Dzuba Law sees this opportunity as a coming of age for the firm, being recognized as a “successful international law practice”, as well as a recognition of prominence given that such speaker-ships are generally very difficult to come by. We are definitely thrilled to mingle with the very top lawyers in the field at this upcoming anticipated conference, share insights on developments in international law, and discuss the “how-to” of doing business in the new global economy. We appreciate the opportunity to be part of this preeminent event, and we are excited to keep on pushing and growing the firm in the months and years to come!